My nickname is Abrotons because my real name is A. Brotons. 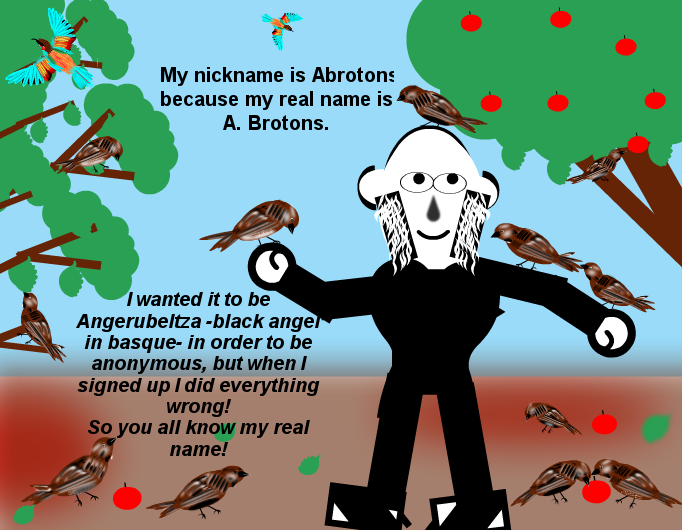 I wanted it to be Angerubeltza -black angel in basque- in order to be anonymous, but when I signed up I did everything wrong! So you all know my real name! — Ha ! ... enchantée ! Actually I only knew your first name. I hope it's not a big problem that people know you're A. Brotons. Now it sounds weird to call you "Abro". Mistakes are god sometimes...I mean good. so I snuck into another one. Employees caught me. They threw me out into the mall. But then it happened: I bumped into a random guy. He said &quot;Excuse me,&quot; and he tried to walk away. But I had just had a psychic vision. I know, I know, I know your name.